28.XI.2018. Il ricevimento studenti odierno è cancellato a causa di un mio impegno fuori sede. From Combinatorics to Philosophy, a collection of contributions delivered at the G.-C. Rota memorial conference held in Milan in February 2008, has appeared. The volume is edited by E. Damiani, O. D'Antona, F. Palombi, and myself. A conference dedicated to the work of G.-C. Rota in mathematics and philosophy took place at the University of Milan this month. The Festschrift in honour of Daniele Mundici on the occasion of his 60th birthday has appeared. A series of confe­rences on many-valued algebraic logic run by Stefano Aguzzoli, Brunella Gerla, and myself. Click on the image above to downaload the 2008 conference poster. 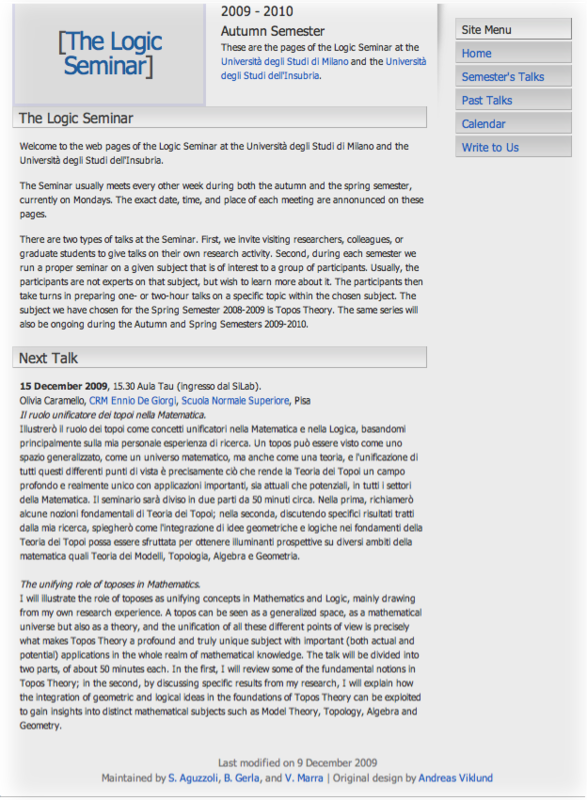 A seminar on logic and related topics that I co-run with Stefano Aguzzoli and Brunella Gerla. Click on the snapshot above to access the seminar's web site. Maintained by Vincenzo Marra | Designed by Andreas Viklund.